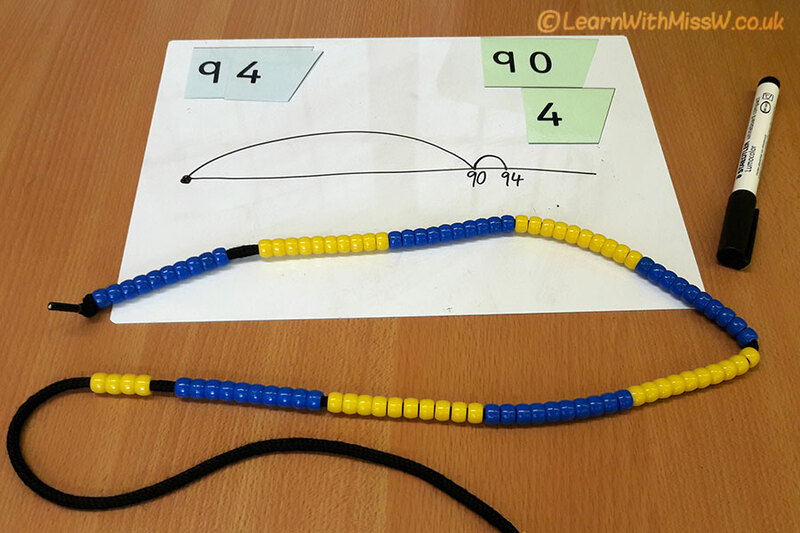 Visualising numbers again, this time with empty numberlines. We’re still working on the quantity model of number, which correlates with numbers on a numberline. Conventional numberlines, with a series of numbers written on it, are helpful to support counting on and back strategies of addition and subtraction. An empty numberline does a slightly different job, helping children to visualise and keep track of how they are manipulating numbers. Like a regular numberline, the numbers should always appear in order. Above we can see that 94 can be represented with 9 tens (90) and then 4 more. Adding onto the numberline moves you right, taking off moves you left. One of the children made 94 with the beads taking the whole 100, then taking off 6. This compensation model can be easily represented on an empty numberline, showing how a jump to 100 is actually too far, and that you have to hop back 6 to get to 94. My P4s have been using this strategy to visualise numbers into the thousands.